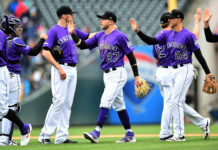 The Rockies finished with their best record in the month of June (13-14) under Walt Weiss, even after losing Gerardo Parra, DJ LeMahieu and Trevor Story to injuries. A lot of that has to do with the players that have stepped up off the bench to fill starting roles. After Parra suffered an ankle sprain, Brandon Barnes was recalled from Triple-A on June 17. Since that time he’s put together a six game hitting streak, tied for the longest in his career, and hit .324 in 11 games. Before Barnes came to the Rockies via a trade with Houston following the 2013 season, the biggest highlight in his career was hitting a walk-off ground rule double to defeat the Rockies. The Rockies showed interest in Barnes after that and he values the faith the team has put in him. Even though he has been demoted to Triple-A several times. Another Triple-A standout who has filled in for Story and LeMahieu of late is Christhian Adames. The shortstop had his own impressive spring but the team had a logjam with the emergence of Story. 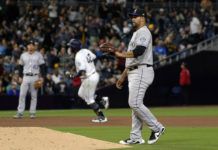 Rockies’ closer Carlos Estevez translated from Spanish as Adames spoke on the difficulties of adjusting to a utility role. One of those players that have developed a mentorship role with Adames is Daniel Descalso. The utility infielder has a veteran presence on this bench and has helped Adames’ preparation with his experience at many different positions. His first year in St. Louis in 2010, Descalso played a lot of third base, then second the next year and after that more consistently at short. With 129 career games at shortstop coming into the season, it’s not a stretch to think that Descalso might have been the Opening Day starter if he did not break his hand. Instead Descalso continues to move around. Tony Wolters knows something about versatility as he has adapted to catching after he started his career as a shortstop. 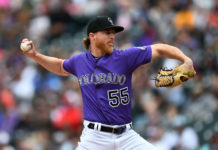 But even Wolters has shown growing pains not starting every day and having to go late into the rain-delayed game two versus the Toronto Blue Jays. In the ninth inning, Wolters missed a catch thrown by Jason Motte, nullifying a potential double play. But Wolters saving grace will always be his play behind the plate. Team dedication is keeping these utility players united. Doing anything they can to help the Rockies win is the main mission. Even when those opportunities come intermittently. Ryan Raburn, added this offseason after spending seven years in Detroit and three in Cleveland, has seen action in 60 of Colorado’s 78 games. He’s logged 130 at-bats, 57 of them in June. His 9 RBIs in June are tied with Descalso for most among the bench contingent. The uncertainty of being called up can’t even interfere with their mission. Yet, despite exuding dedication and humility, Barnes still doesn’t feel like he belongs here. 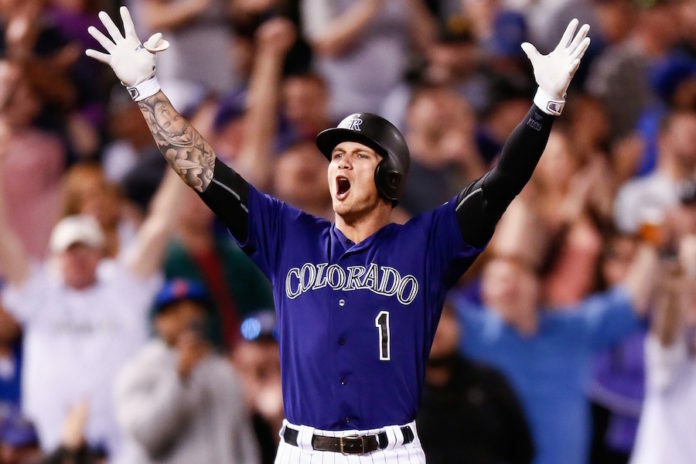 For the Rockies, the dedication of these role players will be key if they are to surge in the second half of the season, no matter who is on the field.